El Chalten / Fitz Roy, hill lies within the Los Glaciares National Park on the Argentine side, in the city of Chalten with more convenient access to the National Park on the north by the National Route 3 to Rio Gallegos, continuing along the Provincial Route No. 5, National Route 40 and Provincial Route No. 11 to the town of El Calafate, a distance of 50 km East Park. This summit offers an impressive spectacle to show their peaks and ridges between glaciers and clouds and at certain times of day take surprising as colorful sun lighting. The whole area is a beauty with forest areas, glaciers, inhospitable lands, depopulated and with monumental views. Cerro Chalten, is a mountain located 3405 meters east of the Southern Patagonian Ice Field on the border between Argentina and Chile, in Patagonia, near the town of El Chalten. Dr. Francisco Moreno and Fitz Roy baptized the March 2, 1877 in honor of the captain of HMS Beagle, Robert Fitzroy, who toured the Santa Cruz River in 1834. Although official maps Argentina has preferred in recent years , recovering the ancestral name and rename the detriment Chalten Fitz Roy, which was used for much of the twentieth century, the latter is the name used by the Chilean official cartography. 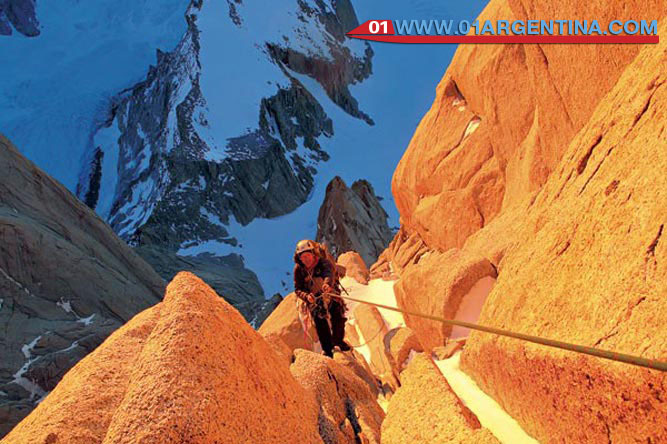 The Fitz Roy and Torre are two mythical summits for any climber. Expeditions from around the world flock to the province of Santa Cruz in the hope of achieving any of them promotion. From the heights, the views over the continental ice field are daunting, even for the most experienced climbers. The summit of Fitz Roy, almost permanently cloud cover, he tehuelches led to believe that the mountain was a volcano. Beside her needles Mermoz, Poincenot and Gillaumet, and flanking Cerro Torre, Egger, Standhardt and Bifida, needles complete the impressive cast of mountain glaciers that blunt rising into the heavens. The Fitz Roy (3,405 m) is one of the mountains that more magnetism exerted on the climbers. The summit was first reached in 1952 by the so-called French Way. Today, there are several ascent routes. From the chair of the French ascend Californian, English and Argentina tracks; from the glacier Piedras Blancas up the Spanish Road; from the Pilar This, the Linea di Eleganza, Goretta, Kernin-Knight, fried cakes Chimichurri and routes. The ascent up the western side has been achieved since the Polish roads, Afanassief, Tehuelche, Daydream, Czechoslovak and Supercanaleta. As for the Cerro Torre, the first climbers to reach the summit (3,128 m) were Maestri and Egger in 1959, and the north wall. Via Ragni, in the east, it was used to climb in 1974 and 1977. On the southeast side, opened the Via Maestri Compressor, to be completed in 1979 for the first time and has been used ever since. The routes have difficulty grade 5-6 according to the French system and around there are options for all levels.